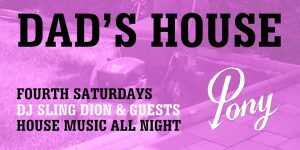 Dad's House brings you house music all night long! Whether you are a fan of the mid 80s house explosion of Detroit and Chicago, or more of a 90s club-house kid, come to Pony to shake your buns. Resident Dad, DJ Sling Dion, brings you the soundtrack, with a steady stream of four-to-the-floor guest DJs.